Planning a wedding and executing the plan is no joke. 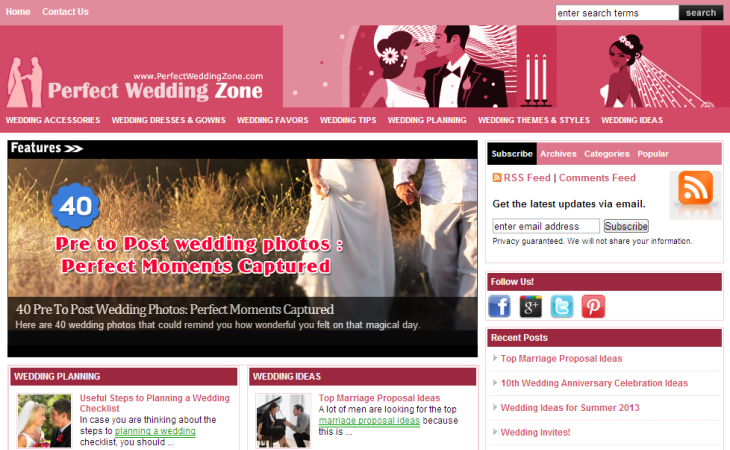 At perfectweddingzone.com we relate to the challenges of creating a perfect wedding. Hence we have come up with this site that documents all the essentials of a wedding event. perfectweddingzone.com hopes to become the single stop for planning the big day. The information provided on this site covers all segments of this big event right from zeroing down on the venue to making the right choice of the wedding bands. The site brings to its readers the latest in wedding themes and also updates the current trends in honeymoon destinations for the newlyweds.